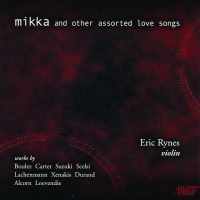 “Mikka and other assorted love songs.” Pierre BOULEZ: Anthèmes 1 (1992). Elliott CARTER: Riconoscenza (1984). Kotoka SUZUKI: Sift (2001). Giacinto SCELSI: L’âme ouverte (1973). Helmut LACHENMANN: Toccatina (1986). Iannis XENAKIS: Mikka (1971). Joël-François DURAND: Roman (1982). Michael ALCORN: Crossing the Threshold (2001). Theo LOEVENDIE: Dance (1986). Eric Rynes (vln), Kotoka Suzuki, Michael Alcorn (electronics). Albany Records TROY1614 (1 CD) (http://www.albanyrecords.com/). There will be those who get the pun in Rynes’ title, but I wasn’t one of them. Rynes’ nine-item program presents old and new friends. The Suzuki and Alcorn require electronics, enabled here by their composers. Suzuki’s Sift is wispy and suggestive as Rynes floats above. Alcorn’s Crossing the Threshold is far more dynamic and interactive. The pieces with electronics are the longest items. Rynes takes a welcome rational approach to Scelsi’s L’âme ouverte. Lachenmann’s Toccatina, essentially an essay on how to make sounds with the screw at the end of the bow, is captured closely and comes across boldly. The Boulez, Carter and Durand are similar in that each requires the soloist to take on definite characteristics and present material using techniques such as trills (Boulez), alternating contrasts (Carter), polyphony through register (Durand). It surprises that Durand’s svelte Roman hasn’t been recorded before. I found the Scelsi-Lachenmann-Xenakis sequence engaging as a separate meta-trio. Loevendie’s Dance concludes with bold rhythms and foot stomping requiring an ankle bracelet laced with bells. “Melting the Darkness.” Iannis XENAKIS: Mikka S (1976). Georg Friedrich HAAS: de terrae fine (2011). Oscar BIANCHI: Semplice (2010). Christopher BURNS: Come Ricordi Come Sogni Come Echi (2011). Alexander SIGMAN: VURTRUVURT (2011). Ileana PEREZ-VELASQUEZ: un ser con unas alas enormes (1996). Robert ROWE: Melting the Darkness (2011). Miranda Cuckson (vln). Urlicht AudioVisual UAV-5988 (1 CD) (http://www.urlicht-av.com/). As noted previously, Cuckson is a fearless explorer. Considered as a pair, the first two pieces by Xenakis and Haas can be heard as essays on microtonal sliding across more than four decades: Mikka S is abrupt and angular whereas de terrae fine is slower and more contoured. Haas contributes the longer piece whereas Xenakis’ is the shorter. Bianchi’s Semplice suggests a diced Paganini Caprice with jumbled motifs and gestures including fingers moving in intentionally “wrong” virtuosic patterns. Come Ricordi reflects Burns and Cuckson’s work (http://www.lafolia.com/maestro-di-suoni-e-silenzi-necessary-nono-4/ and http://www.lafolia.com/utopian-listening-reinvigorating-nono-in-america/) with Nono’s La lontananza nostalgica utopica futura. Some gestures are borrowed (the title appears in Nono’s score as an indication), and other similarities include the six-part structure and the vocalizing soloist, but the contemplative piece satisfies without knowing Nono’s work. The remaining items incorporate tape. VURTRUVURT ’s title indicates Sigman’s four operations: V specifies “Vehicle and Volume, not Violin,” and is pre-recorded; U (“Union”) balances violin and tape; R (“Resonance, Recording, Reflection…”), etc. The immediate encounter is with a burst of traffic or transportation noise; later the violin explores coarse sound production and delays. The contrast with Burns’ preceding, ethereal Come Ricordi couldn’t be more striking. For un ser con unas alas enormes (“a being with enormous wings”), the violin is captured with strong reverb that folds nicely into the tape’s reverberation and echoing. It surprises to learn that the material is derived from one of Cage’s Freeman Etudes (No. 17). In Rowe’s Melting the Darkness, the violin part was created first; then the tape with processed violin, percussion and other sounds was built as accompaniment. The solo violin part is lyrical, in contrast to the tape and other pieces here. “For Ko.” J.S. BACH: Violin Partita No. 1 in B minor, BWV 1002 (1720). Caleb BURHANS: Remembrance (2015). Clara IANNOTTA: Dead Wasps in the Jam-Jar (2014-15). Matt MARKS: Trunket’s Sarabande (2015). Andrew GREENWALD: Bourée (2015). 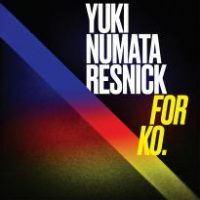 Yuki Numata Resnick (vln). Innova 951 (1 CD) (http://www.innova.mu/). Numata Resnick offers Bach’s First Partita for violin solo interleaving the movements with four commissions that reflect the Bach movements that surround them. Bach’s eight-movement Partita includes four doubles which are variations on the preceding movement (Allemanda, Corrente, Sarabande and Tempo di Borea) employing the same chord progression but with material moving at a faster pulse. The new pieces follow each pair, thus extending the Doubles. The Bach stands up well to its new neighbors. Burhans’ Remembrance expands Bach’s see-sawing gesture and harmonic motion. Title and mood suggest Silvestrov, except that Burhans charts a less maudlin direction. Iannotta explores high-pitched noise and sounds at a quiet extreme, perhaps all on the “wrong” side of the bridge. The subsequent Sarabande is quite magical: Marks’ piece tells the odd story of a monkey, asking the player to play and recite (perhaps recorded separately). Greenwald’s Bourée litters Bach’s chords and gestures across a landscape of harmonics and scratches. 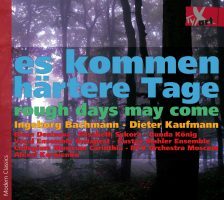 “es kommen härtere Tage – rough days may come.” Dieter KAUFMANN: EVOCATION – Oratorium gegen die Gewalt, Op. 11 (1968)1; Concertomobil, Op. 18 (1971)2; Paganihilismo, Op. 77 (1997)3; Elena en Face, Op. 132 (2011)4. Elena Denisova1,2,3,4 (vln), Elisabeth Sykora1 (sop), Gunda König1 (recit. ), Vocal Ensemble Budapest1, Gustav Mahler Ensemble1, Collegium Musicum Carinthia2, RTV Orchestra Moscow4, Alexei Kornienko1,2,4 (cond.). TXA 14039 (1 CD) (http://www.tyxart.de/). The violin appears as soloist across these four very different pieces. The first is an anti-war oratorio, written “under the influence of the student protests in Paris in May 1968” which Kaufmann encountered firsthand while attending Messiaen’s classes. The three movements use Ingeborg Bachmann’s poems and scoring draws from soprano, speaker, violin, piano, string quintet, vocal trio, chorus and strings orchestra. Despite the demonstrated enthusiasm and powerful message, this EVOCATION does not wear well. Concertomobil presents a movement for violin and tape after a string orchestra movement and then creates a combination for the third part. That parts of I and II appear in III, and that each part comes close to six minutes, suggests there is flexibility in performance. Paganihilismo whips up a frenzy with bits of Paganini and “512 cloned violinists” via multiple recordings. The live solo violin is a bit hard to tease out as Denisova is featured on the tapes. It is the sort of magnification and transformation of Paganini you might dream of. Elena en Face is for violin and chamber orchestra, short but striking. Perhaps the most traditional concerto work here with bold orchestral colors, tonal chorale gestures suggesting Bach and Berg, alongside plenty of harsh sound masses. Non-traditional noises (static, the grinding of a braking train) suggest a tape here too, but one isn’t indicated. Hans Werner HENZE: Il Vitalino raddoppiato (1977)1; Violin Concerto No. 2 (1971; rev. 1991)2. Peter Sheppard Skærved1,2 (vln), Omar Ebrahim2 (speaker), Longbow1, Parnassus Ensemble London2, Peter Sheppard Skærved1, Hans Werner Henze2 (conds.). Naxos 8.573289 (1 CD) (http://www.naxos.com/). Henze handles the past in two different ways on this disc. The first piece is an extended, perhaps rambling discourse on Tomaso Vitali’s Chaconne, the title translating somewhat to “little Vitali doubled,” in which Henze intersperses the original chaconne with his own mutations as the violinist struggles valiantly to stay afloat. At 33:17, it grows serpentine, sometimes tedious and dreary, elsewhere fascinating in its variety and orchestration. Vitali is doubled up at moderate expense, and Henze perhaps purposely belabors his argument. The repetitions, freely wandering between Neo-Baroque, semi-serial and repressed tango, are capped with a modern cadenza, before closing as if in a muddled dream. The Second Violin Concerto shows its composer exploring theatre and “action music.” The violinist arrives on stage late, dressed as Baron Munchausen in an 18th-century frock and wig, and must recite Gödel’s first incompleteness theorem all the while playing difficult stuff. There is also a speaker and a tape part (refreshed for this performance), and at different places the soloist must tussle with the conductor. The composer led this frisky reading in 1991. As audio alone, we miss some of the goings on. Just as it is hard to fathom Henze’s Vitali transformations, it is tough to imagine the violinist’s escapades in the sprawling Concerto. 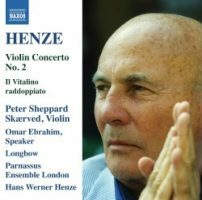 Sheppard Skærved worked with Henze on numerous occasions, and this release with its personal notes and observations, is the culmination of that relationship. I can imagine Il Vitalino being picked up by others, but the Concerto No. 2 is too esoteric and unwieldy, even when the texts are delivered in English, as they are here.